Home Diet Do Polar Bears Eat Dolphins? 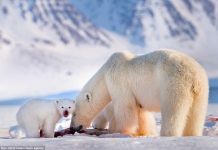 Norwegian scientists believe that polar bears have been forced to feed on species which they had never eaten in 50 years. 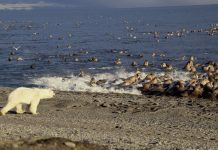 Recently they discovered that polar bears are eating dolphins perhaps for the first time in the Norwegian arctic. Scientists however blame climate change for this much flexibility in the bear’s diet. 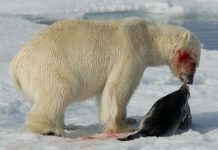 Researchers also photographed polar bears consuming two carcasses of white-beaked dolphins. Now let us find out if polar bears really eat dolphins in the wild. Dolphins are not rare in the Norwegian Arctic but polar bears have never fed on them. During warmer months when the ice floes break up dolphins are rather exposed to the arctic land predators such as polar bears. However in spring they are covered with thick ice sheets yet bears can smell beneath the snow. According to scientists the dolphins might have moved further north due to ice melts. Besides, ice-free winters in the arctic further provoke dolphins to travel northwards. Dolphins must come to the surface to breathe. White bears are always alert to the tiny hole in the ice and whenever a dolphin shows up it just smashes the prey with its powerful paws. Dolphins on the other hand do not seem to have choice; they must breathe through a tiny hole to breathe. Polar bears usually freeze the remains of dolphins (after eating) by covering it in snow. They do so in order to prevent arctic fox or other land predators from smelling it. Bears will get this frozen dolphin the next day when the food is scarce.